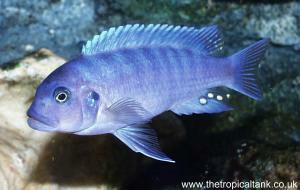 Scientific name: Julidochromis sp. 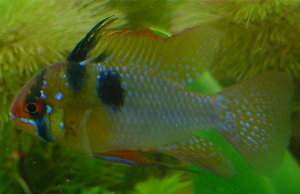 "Gombi"
Feeding: Micropredator, feed flake, granular and frozen/live foods. 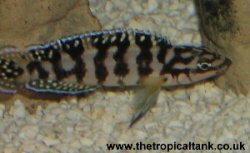 Comments: Many sources refer to this fish as Julidochromis transcriptus "Gombi". 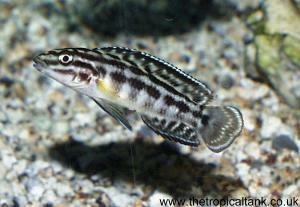 However, doubt has been cast on this variant being a subspecies or regional variant of transcriptus(1). 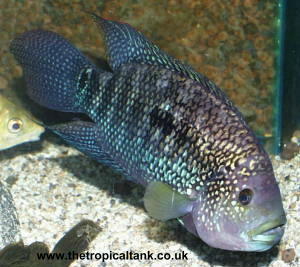 This variant grows larger than J. transcriptus and its markings are more similar to J. marlieri or regani. 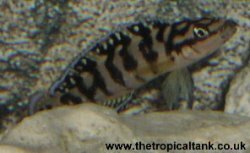 (1) Mary Bailey - The Chequered Julie, Julidochromis marlieri. Tropical Fish Hobbyist, May 2002.